Are you being stressed by Endocrine Disruptors? 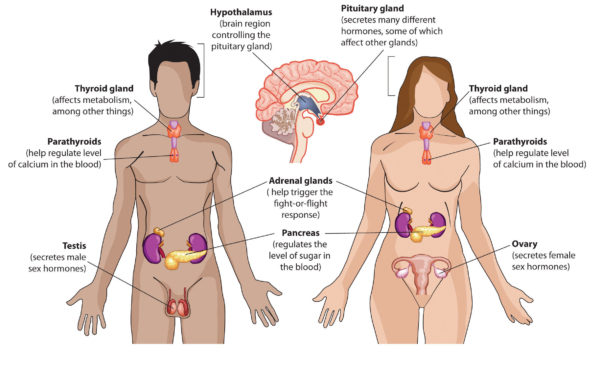 Our endocrine system encompasses the relay of hormones throughout the body. There are eight major glands or hormone producers in the body: adrenals, gonads, pancreas, thymus, thyroid, hypothalamus, pituitary, and pineal. These glands produce hormones that send chemical messages throughout the body to other glands, tissues, and organs. Some of these messages pertain to our metabolism, wake/sleep/energy cycles, stress, arousal, immune, and mood. Our hormones play a large role in how we feel on a day to day basis. There is a strong link to our emotional state and our hormonal stability. In our modern Western society, there are a great number of endocrine-disrupting chemicals that are seeping into our system from our homes and environments. These man-made materials have a wide range of modalities in which they bring our systems out of balance. For example, often times they mimic estrogen in the body, which greatly impacts our immune system, mood, body shape, and skin. Oftentimes, we see adverse effects in development, neurological function, immune response, and reproductive systems from these toxins in our environment. Some chemicals to look out for are: BPA, Dioxin, Parabens, Glycol esters, Perflurorinated chemicals, UV filters (sunscreen), Phthalates, Atrazine,BHA & BHT, Perchlorate, Fire retardants (sprayed on pillows, mattresses, curtains, and fabric of home products), Mercury, Arsenic, and Organophosphate pesticides (like Roundup). For a more extensive review of these chemicals, where they’re found, and what they do, see this article.